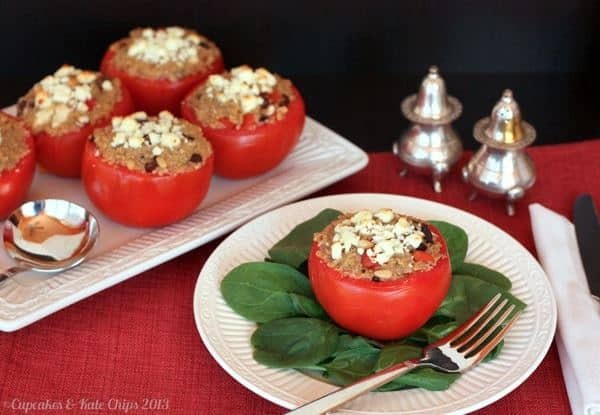 Mediterranean Quinoa Stuffed Tomatoes are filled with a flavorful mix of nutty quinoa, briny olives, salty feta, sweet balsamic vinegar & crunchy pine nuts. It’s Tomatoes! 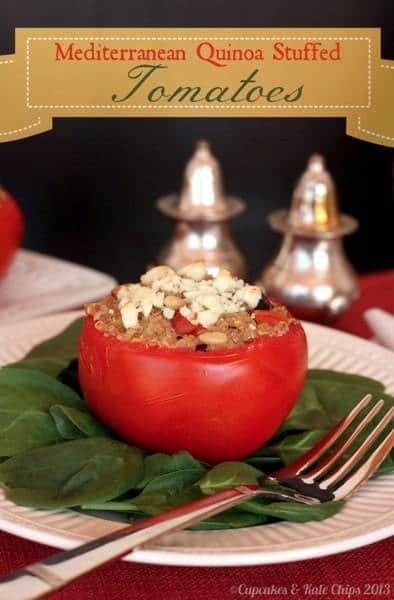 And these Mediterranean Quinoa Stuffed Tomatoes might just be one of the most perfect tomato recipes ever! What’s even better is that I did not have to wait till July or August to enjoy it. You see, in the dead of winter, the only way you’ll get me eating “fresh” tomatoes is to roast the heck out of them to coax out some sweetness and get rid of the mealy texture of the hothouse ‘maters that you can typically find in the grocery store this time of year. 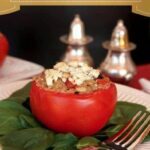 But this recipe takes advantage of the freshness of the tomato – truly celebrates and highlights the tomato. So how did I get my hands on these ruby red gems?! It is tomato season now in Florida, and April is Fresh Florida Tomato Month. The Florida Tomato Committee‘s goal is to maximize the Florida tomato movement, and, especially this month, they want to spread the word about their delicious, sun-ripened and field-grown tomatoes. So even though I am faithful to the illustrious Jersey tomato, I was so excited when I was approached about supporting this campaign, because I can’t get those Jersey reds this time of year. Then I was even more excited when a case that included a sampling of Florida tomatoes from various growers throughout Florida showed up on my doorstep. Tomatoes that had been picked ripe and fresh from the field. Tomatoes like I can get from farm stands right down the road in July and August. And how do I know that they meet my exacting standards? The ultimate test – sliced onto a plate and eaten with jut a bit of salt and pepper. Perfection – juicy and fruity, firm, but yielding, with not a bit of mushy mealiness. I’ve been eating them all week on salads with blue cheese, on my fish tacos. I’m sad that they are nearly gone. The Florida Tomato Committee will be featuring new and original recipes from bloggers on a special website (I’ll update this post with that link as soon as I have it, but for now you can just head to their homepage to find it), as well as their Facebook and Twitter accounts, that celebrate the Florida tomato. So be sure to check them out for some great recipes as they celebrate Fresh Florida Tomato Month all throughout the month of April. 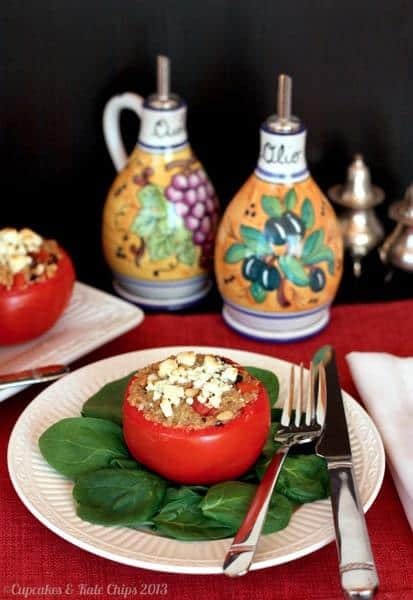 And my recipe is these Mediterranean Quinoa Stuffed Tomatoes. I’ve made several variations on this over the years, and the one key aspect is having good, fresh, delicious tomatoes. I usually only make it in the summer, so it was a real treat to have in March. 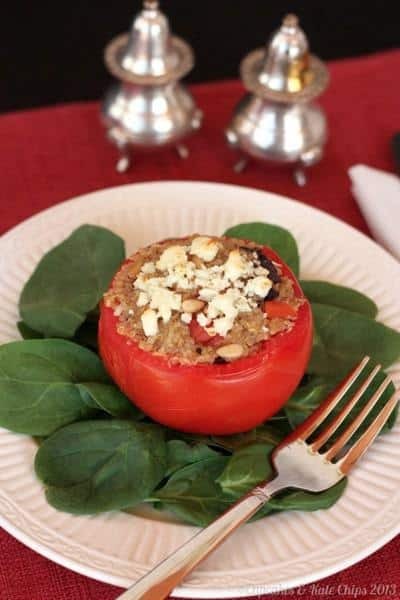 The quinoa has briny olives, salty feta, crunchy pine nuts, and just a hint of the sweet tang from balsamic vinegar, but the tomatoes themselves have to be delicious on their own, because they are filled with the already-cooked quinoa mixture, and then just warmed through slightly. So the flavor and freshness of the tomato is truly highlighted. 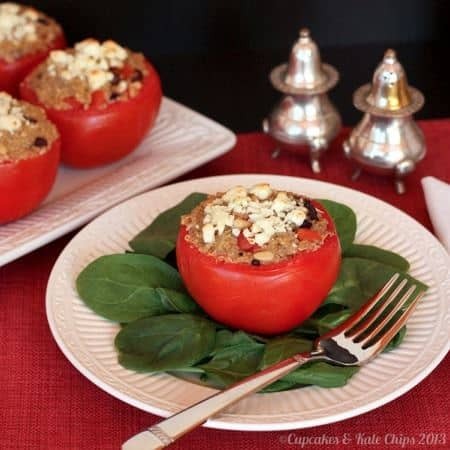 Just one Mediterranean Quinoa Stuffed Tomato make a delicious side dish, or a lovely lunch atop some baby spinach or salad greens with a little extra drizzle of olive oil and balsamic vinegar, or have a couple for a satisfying vegetarian meal – ideal for Meatless Monday. OK, I’m gonna be honest – The Bug, try as I might, is just not a fan of tomatoes OR quinoa (I know!! The kid eats salmon and polenta and broccoli and cauliflower like it is candy, but won’t go near a tomato unless it is in sauce or ketchup form – I have to pick them out of frittatas). 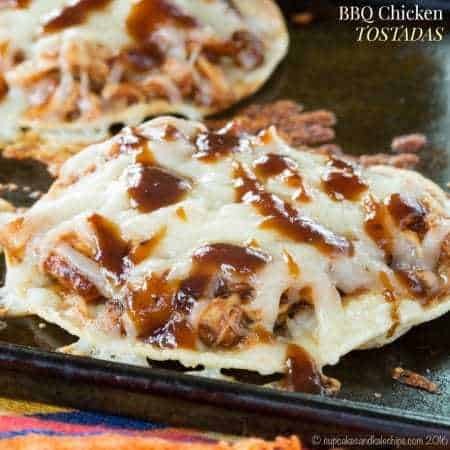 But The Hubby and I just adored this recipe. We had it for dinner twice – with roast chicken and with some turkey sausages – and I had it for lunch a couple of times over some mixed baby greens. The Hubby commented on the freshness of the tomatoes – he said they truly tasted like a fruit, with no acidity and the natural sweetness coming through. And obviously they reheat well, or can be enjoyed cold. So keep an eye out for Fresh Florida Tomatoes in your local grocery store. And follow Florida Tomatoes on the web, Facebook, and Twitter for more tasty recipes to celebrate this wonderful red fruit all month long! How do you like to enjoy fresh tomatoes? Salads, sandwiches, salsas, or do you just like to bite right into them? Combine the quinoa, broth and oregano in a saucepan. Reduce heat to medium-low and simmer for 10-15 minutes, or until quinoa is cooked and liquid is fully absorbed (or cook as per package instructions). While the quinoa is cooking, slice about 1/2 inch off the tops of the tomatoes, and set tops aside. Scoop out the insides of the tomatoes so that you have just a shell remaining. Sprinkle the insides of the tomatoes with salt and pepper and place in a baking dish. Dice the tops of the tomatoes so that you have about 1/4 c diced tomatoes, and set aside. Once the quinoa has finished cooking, stir in the olive oil, balsamic vinegar, chopped olives, 1/2 c of the feta, pine nuts, and reserved diced tomatoes. Add salt and pepper to taste. Divide the quinoa mixture among the tomatoes and pack in slightly. 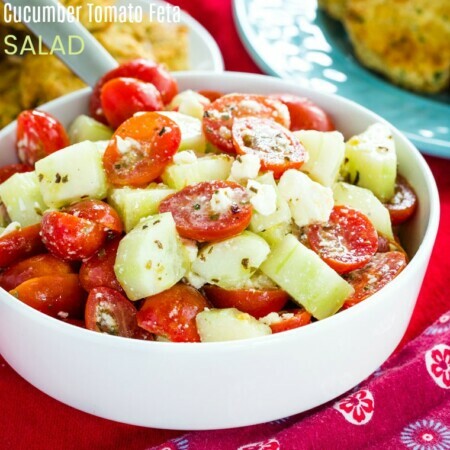 Divide the remaining 1/2 c feta cheese over the tops of the tomatoes. Bake for 20-25 minutes, or until heated through, and cheese has browned slightly. 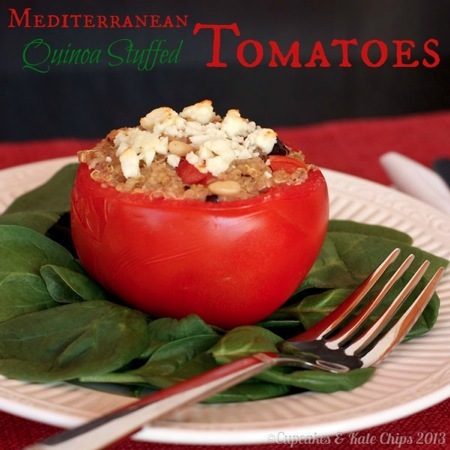 The quinoa mixture can be made ahead of time and refrigerated, but you may have to bake the tomatoes slightly longer in order to warm the quinoa through completely. Disclaimer: This is a sponsored post on behalf of the Florida Tomato Committee. I was provided with a case of fresh Florida tomatoes, and compensated for my time for recipe development, however all opinions expressed are 100% my own. 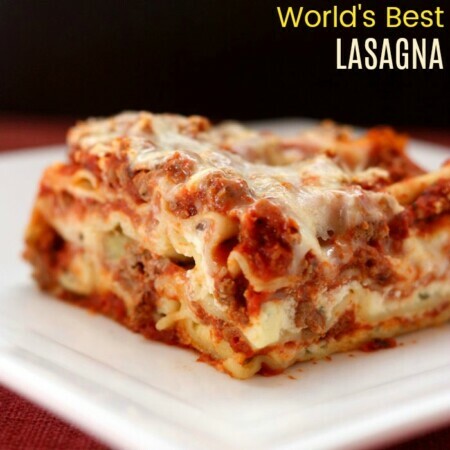 Want to see lots more yummy food from me and my friends, and cute pictures of my kids? Or have Cupcakes & Kale Chips delivered to our Inbox by entering your email in the box on the left sidebar. 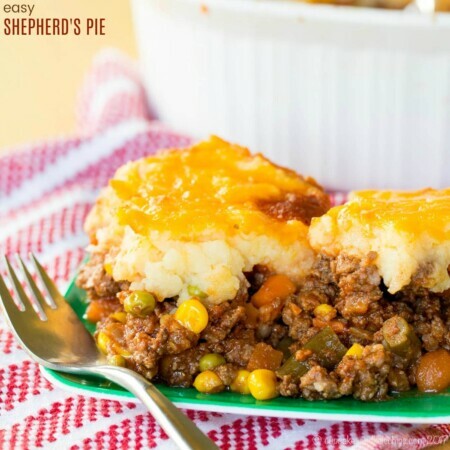 Your photos are lovely and your recipe looks very tasty and healthy! What a pretty presentation!! I love tomatoes on sandwiches, roasted in the oven, in sauces..I could go on and on! Fresh tomatoes are always best!